Just two days before moving away from Seattle, I spent the day hiking this trail (& lamenting my departure) with two of my close friends, Angel & Dallas. 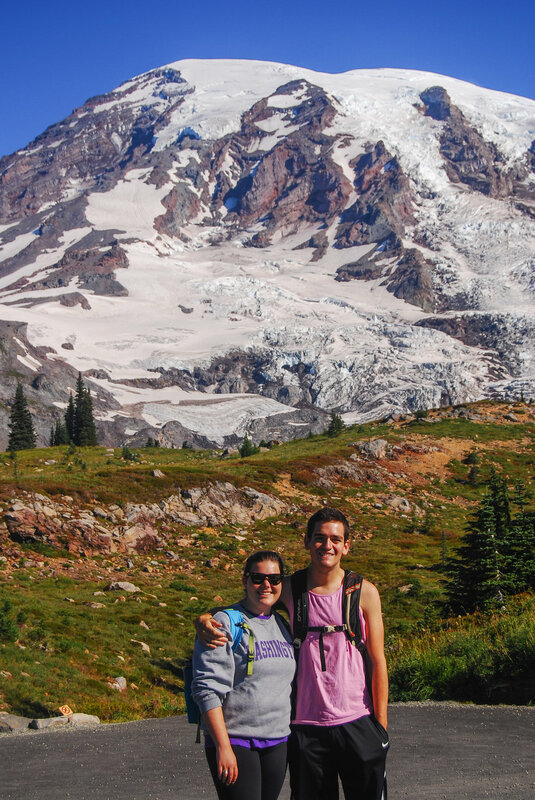 This trip was my very first visit to Mount Rainier. I knew I needed to see her close up, as I had been admiring her from afar in Seattle for four years. 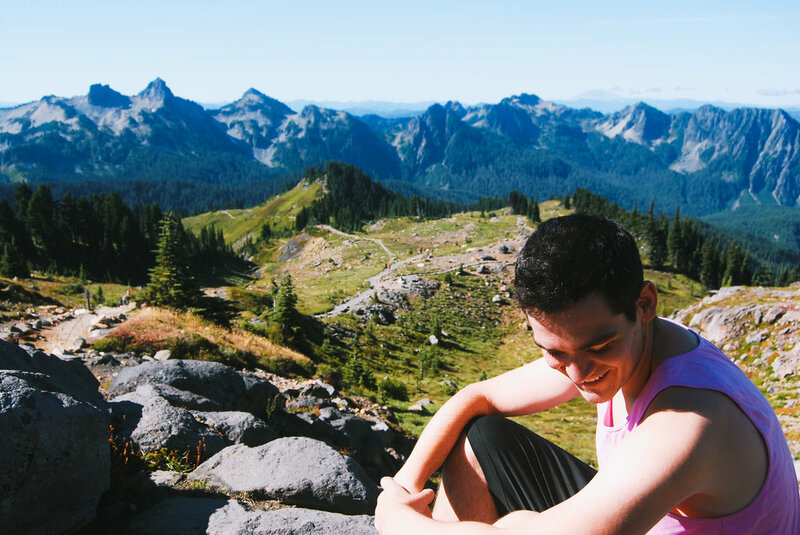 It was the most perfect send-off from Washington, and I'm so happy my friends joined me on this trip (especially considering I made both of them hike & travel with me earlier in the week). 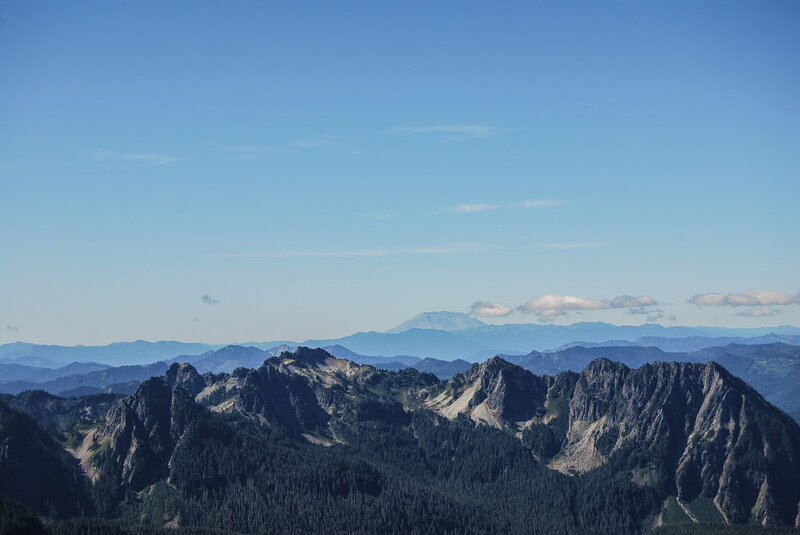 If you can peel your eyes away from Mount Rainier for a few minutes, you'll find signs for the Skyline Trail starting from the parking lot at the Paradise Visitor Center (hint: find the John Muir quote steps and walk towards Mount Rainier from there). 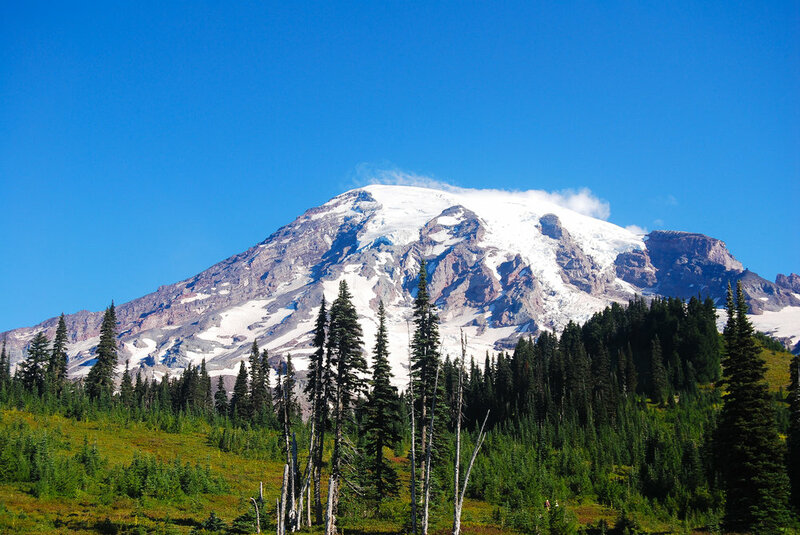 The views of Mount Rainier simply don't stop! 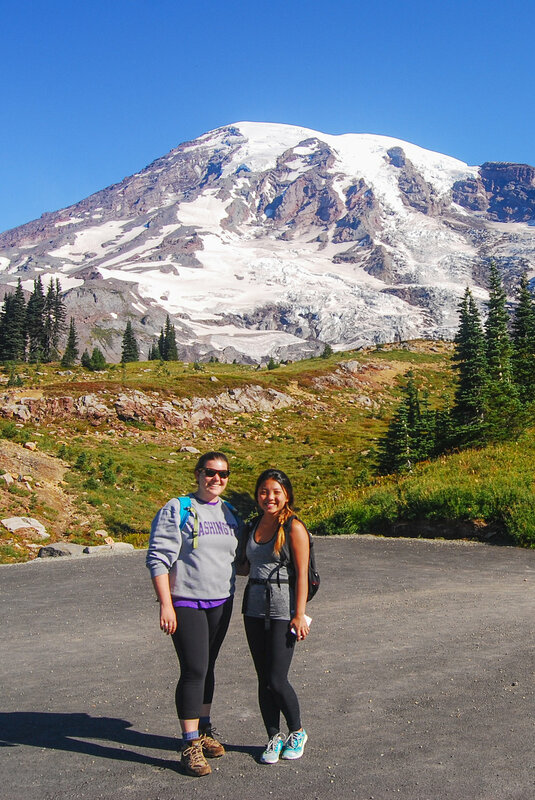 You'll follow the paved trail for a little less than a mile as Rainier looms larger and the trail turns into a real dirt trail. Always ready for a photoshoot with these two. But TBH, we're looking a little awkward here. 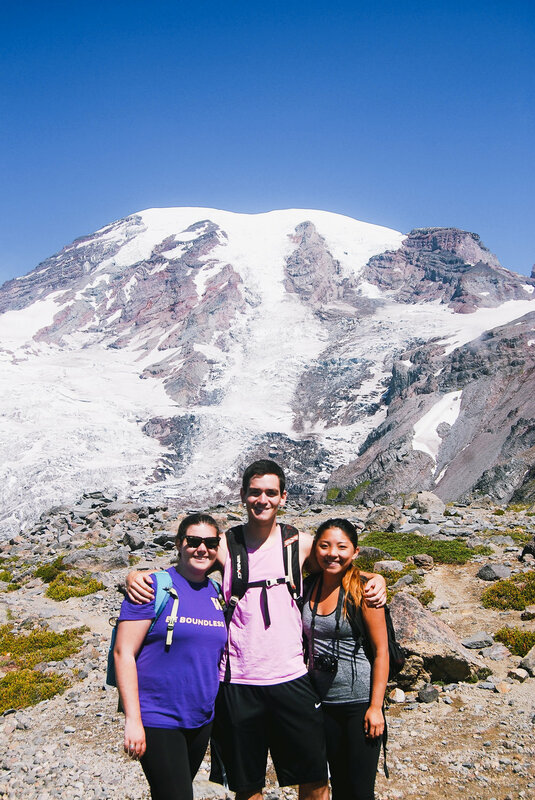 As the trail climbs up, the views just keep getting better, and not just of the mountain (though, the close-up views of the Nisqually Glacier are amazing! Check out that waterfall)! 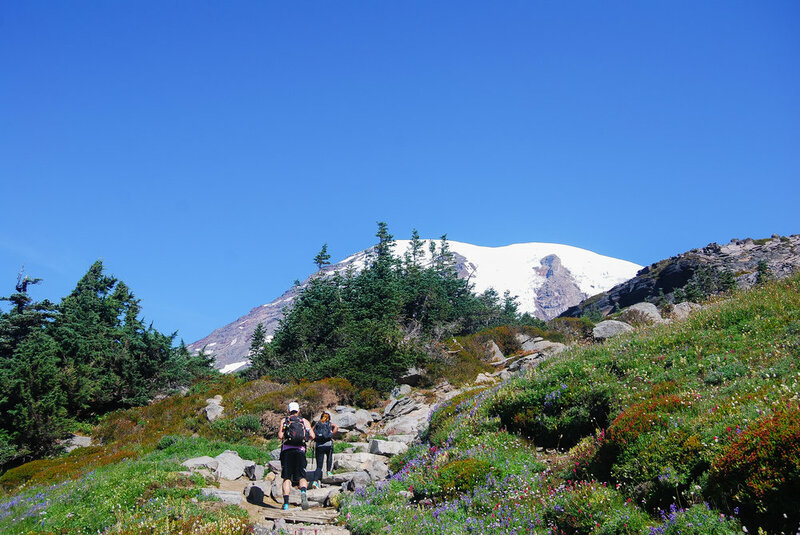 To the right, a beautiful meadow appears, which we discovered we'd be hiking through on our way back on the Golden Gate trail, and behind us, the Tatoosh Range looked very stately with Mount Adams, Hood, and Saint Helens looming behind. 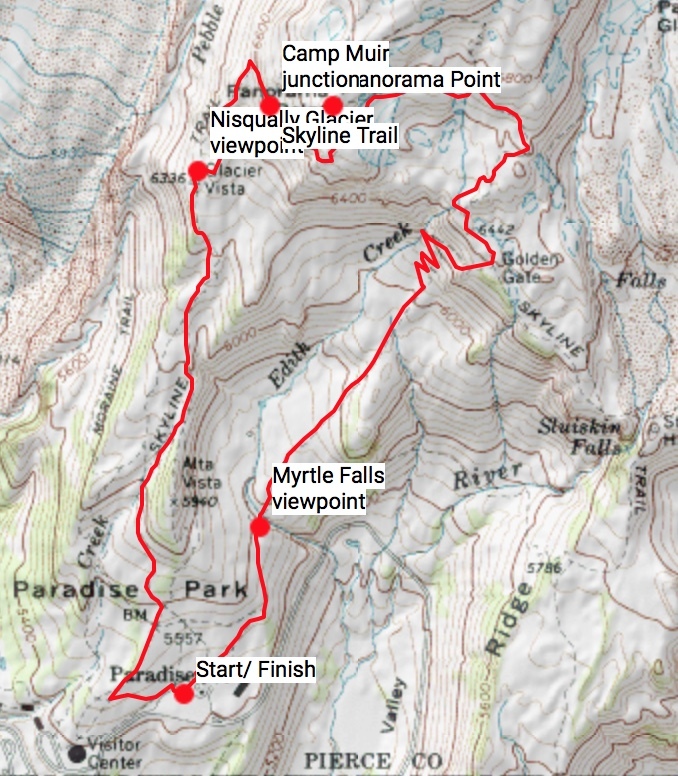 Following the trail onward, we passed the junction to Camp Muir and watched backpackers and mountaineers begin their trek up the snowfield, amazed. We had to turn down the proposition of one backpacker to join them! Ha! I don't think I'd attempt it without microspikes. Continuing down the trail, we rounded a corner and Rainier finally seemed to grow smaller. 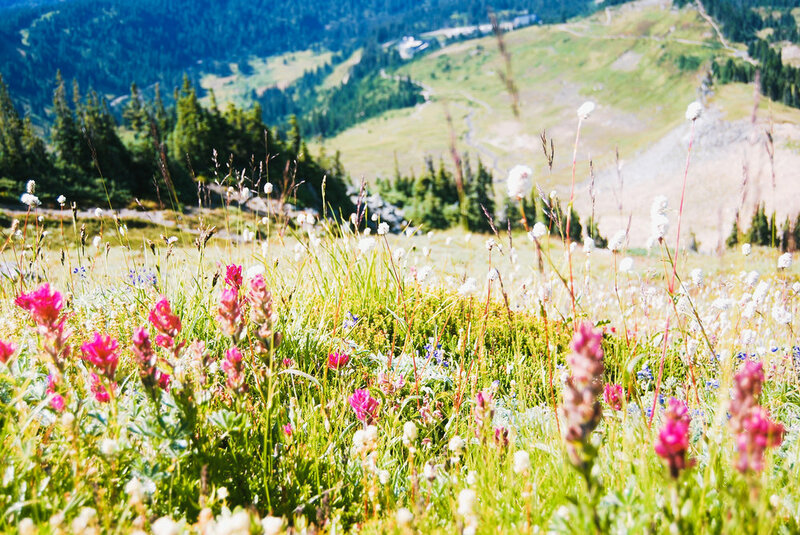 We admired the wildflowers and the wide vistas of the alpine meadows and the Tatoosh Range as we hiked up to Panorama Point. It had grown slightly more hazy by the time we reached Panorama Point, but we still had jaw-dropping views of Washington's (and Oregon's!) surrounding mountains. 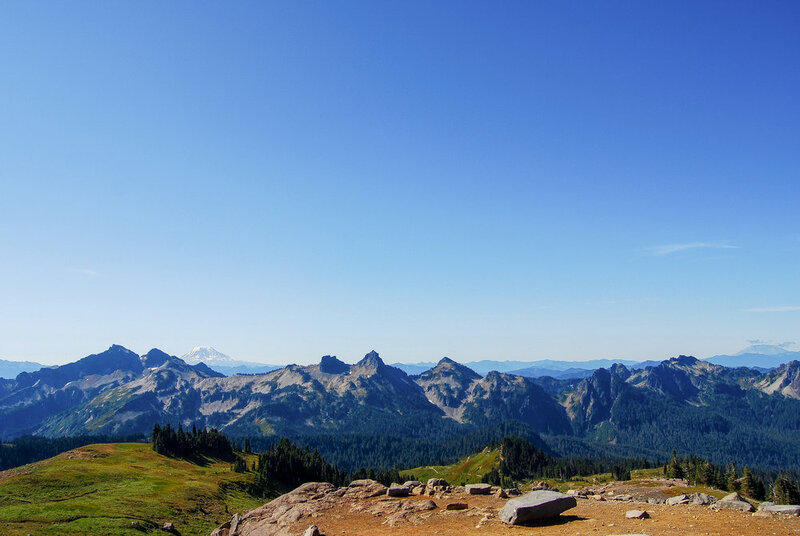 Goat Rocks, Mt. Adams, Mt. Saint Helens, and Mt. Hood were all still visible, which, according to the information sign, is a rare occurrence! We truly felt blessed to see all of these amazing volcanos, and I couldn't believe my luck that on my last hike in Washington, I got to see so much! Panorama point was the high point of our hike, and the rest was all downhill from there! We found some snow to play with and enjoyed walking along the glacier stream through the meadow on our way back to the trailhead. Check out Mt. Saint Helens in the upper left corner! And when we were almost done, we were treated to the stream's waterfall - Myrtle Falls! I couldn't have imagined a better way to say goodbye to my adopted home state than by hiking around it's iconic peak. I only wish I spent way more time in this beautiful National Park before I moved away, but I'll be back to admire it and so much more one day!